Do you remember when I was barking about Global Pet Expo? Do you remember at the end when I asked you to comment, and tell me which products you liked? 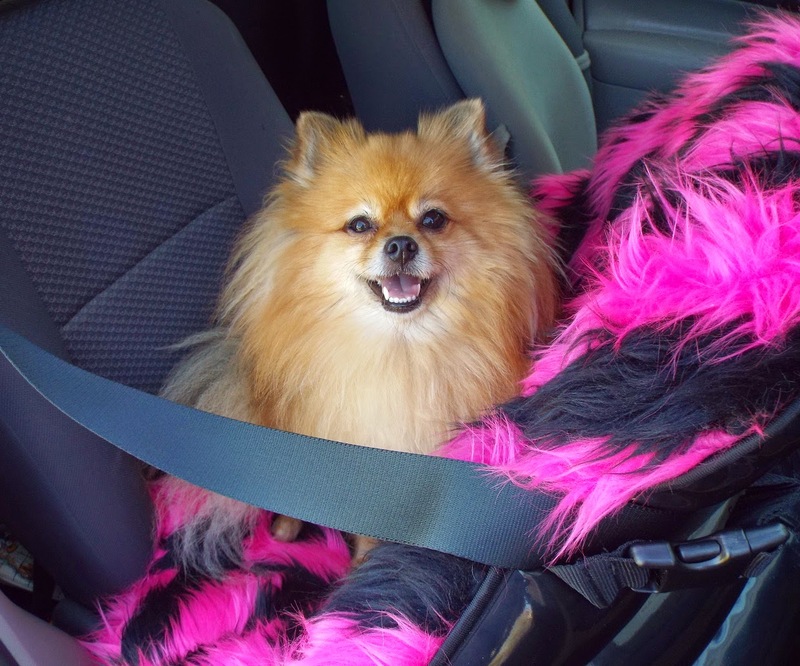 Many of you commented about my pawsome pink car seat. It is a Luxury Lookout from Snoozer. While I was at Global Pet Expo, I barked to Snoozer exactly how much I love my Lookout seat. Now, this is the part that will make you wiggle with joy. Snoozer said I could do a review and giveaway!! OMD!!! Pawsome!!! My new Luxury Lookout from Snoozer is pawtastic! Do you have any idea how hard it is for a yappy Pom to keep a secret? I've been biting my tongue this whole time. 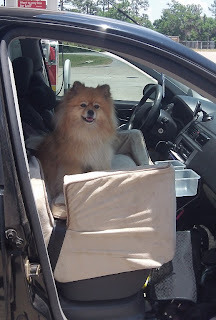 Then I posted about BlogPaws yesterday, and someone mentioned my car seat. I had to bite my tongue again! BOL!! I think my fur blends beautifully with my new Luxury Lookout. My Snoozer Luxury Lookout seat is one of my all time favorite products. I bought my pink one a few years ago, and it is still in furrific condition. It is the only car seat I've used that could possibly last my entire lifetime! My first 2 car seats didn't even last a whole year. The fact that my Lookout is in great condition after three years of hard use, has really impressed Mom. Baron really likes it too. 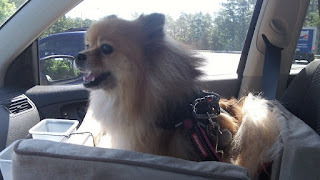 Frequent use - I go everywhere Mom goes because I am her service dog. 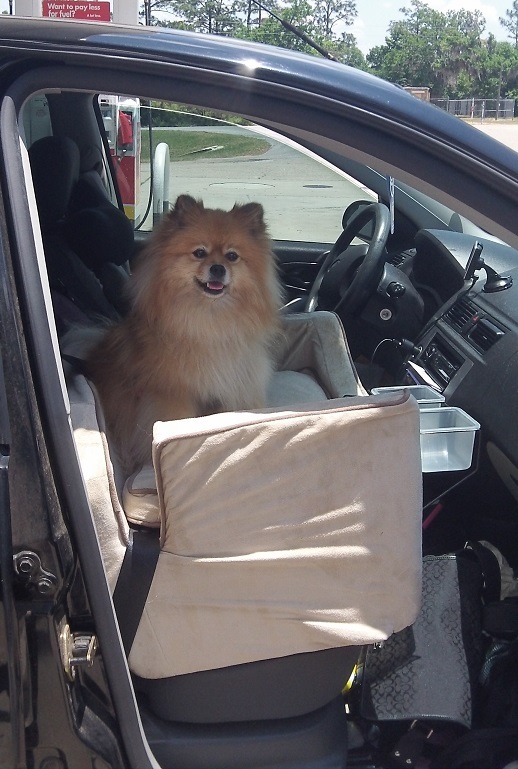 Since I am in the car every time that Mom is in the car, I use my car seat more than most dogs use theirs. I am not petite - At 14 pounds, I weigh enough for 2 standard Pomeranians. 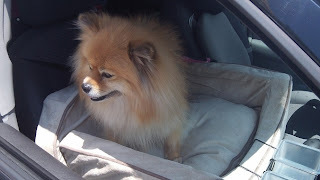 More than one dog - When he rides in my car, Baron rides in my Lookout with me. He isn't exactly petite either. He is about the same weight as me. The two of us together are just over the 25 pound weight limit. I have been known to scratch at my car seat (the digging action that dogs do before they nap). While I may be rough on my car seat, there are worse things which I don't do. For example, I do not try to eat my car seat. We can both fit into the medium size Lookout. Mom takes out the pillow when we both ride in it. I use a medium (or oversize) Lookout. It is the largest one that can fit in my front seat. (My passenger side airbag only turns on if you weigh over 70 pounds.) The medium Lookout is for dogs up to 25 pounds. 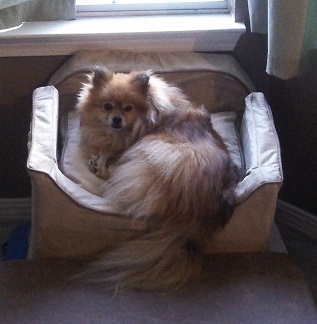 Snoozer makes a perch for dogs who are too large to fit a Lookout seat. The medium Lookout is 19 inches tall, 22 inches wide, and 17 inches deep. It will fit most car's seats, but measure your car's seats to be certain. The inside measures 18 inches wide by 14 inches deep. Your dog needs to be able to fit comfortably in this size space. To test the fit, fold a towel to match the inside measurements. Have your dog "sit" and "down" on the folded towel. I am 16 inches long from my collar to the base of my tail, and I fit in it pawfectly. If I curl up, there is even room for Baron too. BOL!! The Lookout is installed in your car using the seat belt. In my above photo, you can see where the seat belt goes across the Lookout. Your harness is hooked to the seat belt with the provided connection strap. You can order an extra connection strap (replacement strap) if you have 2 dogs who ride in the seat, or if you lose your original one. The Luxury Lookout includes a removable pillow. I put the pillow on top of my seat belt. The pillow also doubles as a nice travel bed. If you want your dog to sit lower in the seat, you can remove the pillow. The Luxury Lookout is the most comfortable car seat I've ever owned. The Luxury Lookout features a washable microsuede cover over a foam core. The cover zips open to remove it for washing. If your cover gets damaged, you can buy a replacement cover. They are pawfect for when you want a different color. 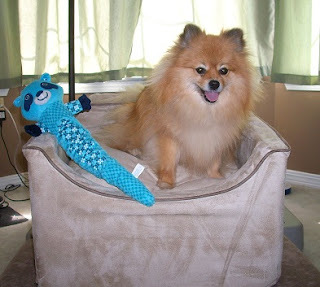 Now that you understand exactly how pawsome Snoozer's Luxury Lookout is, I'll mention a couple of my favorite related items from the Snoozer website! The first accessory I chose to order is the optional travel rack. It holds 2 containers for food & water. I like to nibble when I travel. BOL!! 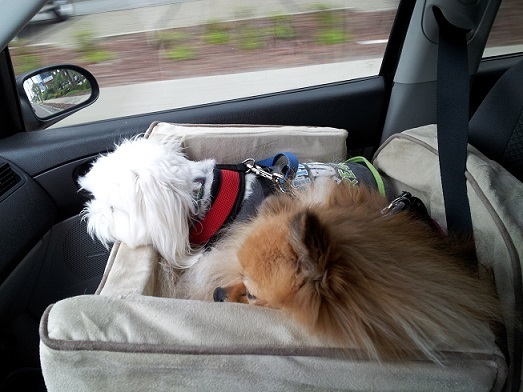 Snoozer also makes the Snoozer Pet Car Seat Safety System. It is crash tested like a human child car seat (30lbs at 30 miles per hour). It features a Lookout seat, and a special harness with a seat belt attachment. If you already own a Lookout, the special harness & seat belt attachment are also sold separately. I am so excited about Snoozer sending a Luxury Lookout to one lucky Pepper's Paws reader, that I am wagging my tail like a cheerleader's pompoms! 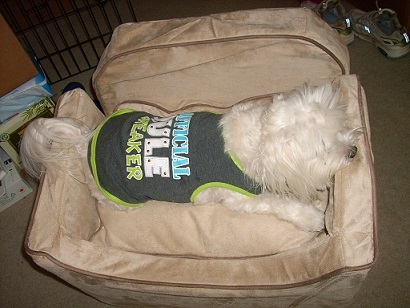 Log into the Rafflecopter widget, and complete the entry options for chances to win the Snoozer Luxury Lookout! Giveaway Disclaimer: I did not receive any monetary compensation for this giveaway. The company will send the prize to the giveaway winner. The opinions in this giveaway are my own and not influenced by any outsider . I receive no additional benefits for talking about the product or company. This is my favorite contest ever! Chester and Gretel have a Lookout but it has seen better days. It's been beat up quite a bit from use. PLUS it only fits 2 Doxies and we go places with our friends all of the time. I would love to have it so I can keep them safe too. Our next planned trip is camping to Deception Pass with about 10 other weiner dogs. OMD I would love to win one! 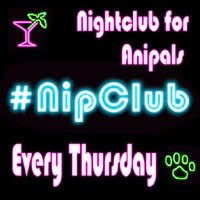 Mom would take me to my favorite holistic pet store in it. I love how you and Baron look together in your seat, Pepper. I really like this snoozer.. I want it & I hope it comes in green.. MOL!! The first place I would go to is petsmart..YAY!! Wow, that's one cool car seat. Too bad my dog is 90lbs and would be too big for that thing! Plus, we're Canadian, so I don't think we qualify for this contest. Good luck to all the contestants! Oh Pepper your carseat looks so awesome and very sturdy too! I unfortunately already have my little Ford Mustang backseat filled up with two human carseats =/ Plus Shiner's a little big. 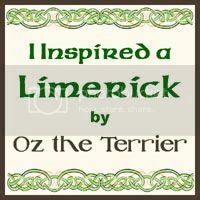 But good luck to all of the littler doggies out there! Pepper you did an excellent review fo4r the Snoozer Luxury Lookout. Excellent review once again, Pepper!!! And you look darling in your car seat...I just love it! Pepper...you know what I just realized?!? My bike basket is a Snoozer Pet Rider Rear Bicycle Seat! It's on Ma's bike...we have had it for ages and I go for lots of bike rides because of my great seat. I even include it in my Amazon stuff on my blog! Pretty neat, no? I love the Snoozer products! And you look so cute in this one Pepper!!! Unfortunately, my dogs are too big for one. They could use the Lookout Perch, though, on our next road trip to Texas. 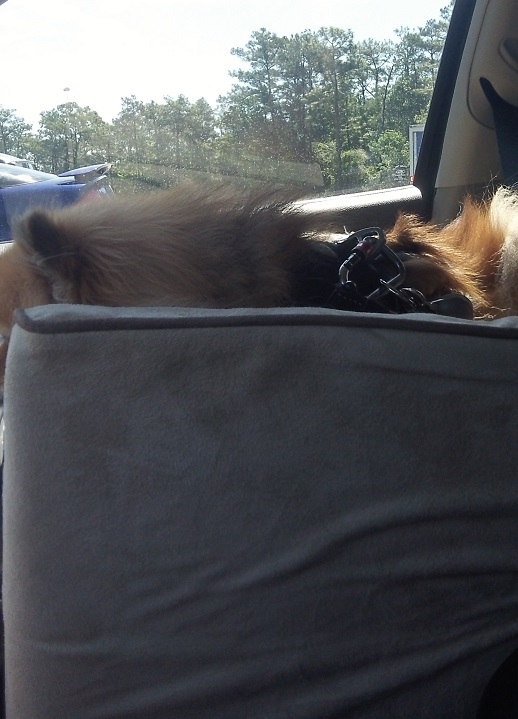 We have been so jealous of your car seat! This one looks equally as pawesome! I am excited about this review. I am always looking for something that I can carry around my fur-babies in the car safely! If I won the prize, I would first go to the Grandparents' house. I will be heading to Kentucky Lake. What a great review Pepper!! 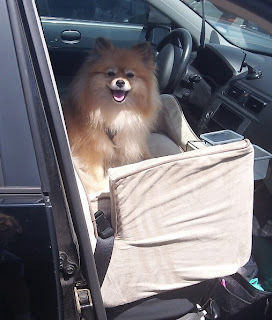 If I were to win this amazing car seat, the first place I would go with Mommy is Petsmart, then we'd go see a bunch of our friends to show them my new Snoozer Luxury Lookout car seat! The first place we would go, if we won, is to the dog park. very cute! we have a whole wiener herd but only one car seat so the others have to travel in crates. this would be very helpful when taking our 3 therapy dogs to visits. 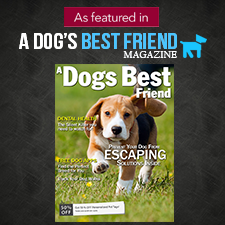 The First Place We Would Go Is To The Pet Store For Some New Treats! Barkly says the first place he would go in the car seat would be to the Doggie Day Care place for some socialization time while mommy/owner have a yack-fest over coffee--a yack-fest that for once wouldn't be about how long it took to wipe the drool from mommy's console-back where Barkly stretched from his car-restraint trying to get on the console. Yep, stretching to try to see would end with the addition of the Snoozer Lookout. My little Loki would love this! The first place we would take it is a trip to the lake to camp and enjoy the summer! Because of this post I bought one for my puppy. She LOVES it!!! I got the same size as Pepper since my boston terrier is also 20lbs and it was PERFECT! Thanks for the great review!! !